After lunch we headed to the Kipsongo Slum. I didn’t know much about it at the time. The schedule said “Eldonna speaks to 40 Ladies.” I was prepared to again share the good, the bad and the recovery with these ladies. It was not far from our quarters so I knew we had several hours there based on the schedule indicating dinner was at 6pm. We arrived at Kipsongo and headed into a building where the ladies were singing and praising God. I almost started to cry when we walked into the building because of the sheer joy coming from these ladies. They have very little. They live in mud huts with a dirt floor and tin roof. Many of them don’t have doors, only cloth to cover the doorway. They have to get water out of a pump that is locked most of the day. 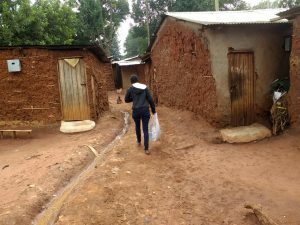 Kipsongo is one of the worst slums in Kenya. 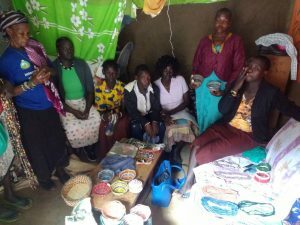 It started in the 1970’s when refugees from the Northern Kenya region of Turkana were forced to flee their homes due to drought and violence and ended up in internally displaced peoples (IDP) camps outside the town of Kitale. The camps were abruptly closed and, with nowhere to go, no resources and little or no education, residents had no choice but to stay in the camp which eventually became the slum that it is today. The buildings are mud huts the size of a small apartment kitchen with dirt floors and a tin roof. They sometimes sleep up to 15 people. There are typically no doors, only a fabric cover to seal off the front doorway. 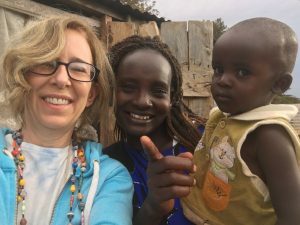 Most children are malnourished, school enrollment and literacy rates are very low (school enrollment in Kenya has a yearly fee), and adequate healthcare and economic opportunity is severely lacking. I shared my story. Another lady shared her story. Then Pastor Steve, our leader asked the ladies to gather around us and pray for us. I was on my knees surrounded by these ladies who were praying for me. I was crying uncontrollably. Here I was coming to serve them and the were serving me? It was amazing. They prayed fervently for 10-15 minutes. I was touched and blessed at their spirit of giving and compassion for others. We toured the slum and one of the ladies asked us to bless her house with prayer. We did. 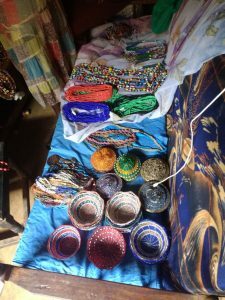 We came back to where our van’s were parked and there were several ladies with beads and baskets for sale that they had made. One of the ladies took me into her hut. Her name is Patricia. 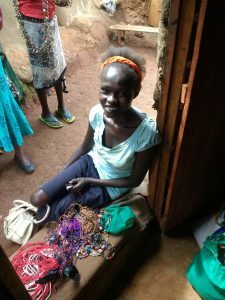 She had 3 of her children in there and she introduced me to her son Maxwell and gifted me a beautiful beaded necklace and asked me to pray about helping he son get to school and get a sponsorship so he could go. I didn’t know the story about the ladies until later after we left. 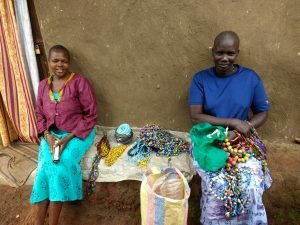 What I discovered is that through a micro loan program, started by another lady who visited there, many of the ladies in Kipsongo have started businesses making and selling jewelry, baskets and other hand made products. 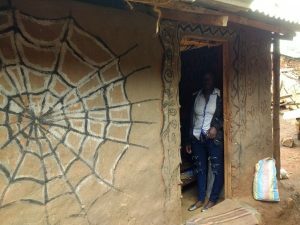 The micro loan covered the cost of the materials. That night while I was sleeping I was awakened with an idea. I believe God birthed this idea in my heart. I remember thinking that it was a cool idea and I tried to roll over and go back to sleep but could not sleep until I wrote it down, then I got so excited about it that I couldn’t go back to sleep! This idea was to go into business with the ladies and bring their beautiful products back to the U.S. and sell them along with my books when I speak. 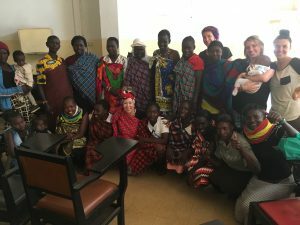 On our last day in Kitale, We had another get together with the Kipsongo ladies. I shared inspiration with the ladies and then shopped with each one of them that had products with them. They adorned me in fabric and told me if I was going to represent them, I had to look like them. I came back with about 100 necklaces and 30 bracelets and 10 baskets. I sold most of what I brought back and had to get more. I am currently funneling 100% of the proceeds from the sale of the jewelry into an account to purchase more and build out the business model. I assume as it grows there will be funds used to cover shipping and other costs but I plan to keep those minimal. The idea has sparked interest in so many people that I am selling them when I speak and also when I’m out and about. At this writing I currently have them in 2 shops in Claremont,CA – Dolce Blossom and Feeling Groovy Wellness. 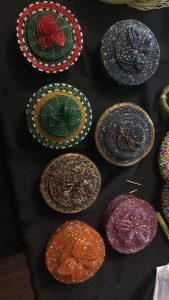 There are also some in Tropez Boutique in I am looking for more boutique type of shops that will carry these handcrafted pieces in their shops. A Facebook page has been created to ensure the word gets out about the project and provide a place for people to stay up to date on the progress, post their support and see what items are available. Please visit and like the page by clicking the link above. This is a very grass roots effort and I am excited to see where it goes. I expect it to grow and expand. 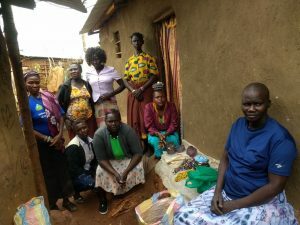 The main purpose is to help these ladies get out of poverty and be able to educate, feed and get medical care for themselves and their families. Many resort to prostitution to make a living. My goal is to eradicate that from their lives and help as many women as I can. I am researching the Ethical Trade initiative and possibly developing a non profit in the future. I want to be prepared as this grows.